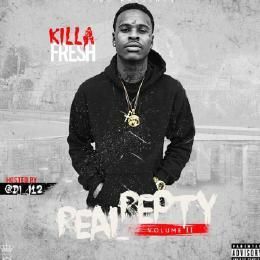 Killa Fresh has a new mixtape out titled "Real Repty 2". East Oakland, California rap artist Killa Fresh links up with the infamous DJ_J12 to deliever some intense street music on "Real Repty 2". Speaker knocking, head nodding track anthems like "My Glock", "Bankroll, and "I'm Having Fun" set the tone that Cali is still active. With features from Stunna June, Team Eastside Peezy, G Val, Chippass, and more. Stream and Download Below.